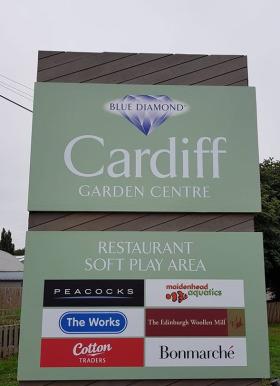 Blue Diamond Garden Centre in Cardiff suffered a blow this week after a fire destroyed large amounts of stock – less than five years after the centre was completely destroyed by a blaze back in November 2013. Luckily firefighters, who were called to the St Mellons business in the early hours of last Sunday (August 26), were able to control the blaze and stop a repeat of the 2013 blaze. However, it is understood that a significant amount of stock has been lost and some damage has occurred. Blue Diamond Garden Centre in Cardiff was hit by a blaze this week, though luckily not as devastating as the fire which destroyed the business back in 2013. A spokesperson for Blue Diamond said: “We are aware of a small bin fire on the outside of the premises, the cause of which is unknown. A small amount of damage had occurred to the side of the building. "Thankfully the fire was extinguished as our on-site video surveillance systems picked this up and alerted the emergency services. The police have been informed and are investigating the incident. The St Mellons garden centre – formerly known as Blooms Garden Centre – only reopened two years ago following the 2013 blaze, which completely gutted the property. Police are currently investigating this week's blaze and have asked for anyone with information to contact Crimestoppers quoting occurrence number 1800325119.